Yeah, your daughter wants red hair. You know why. She has seen one too many mermaid movies where the lead is a ginger. She loves to sing like Ariel, and she likes the story behind Splash, and she loves the setting of Aquamarine. Although, now that you think about it, only one of those is a red head, weird. Your daughter claims that ALL mermaids are red heads. 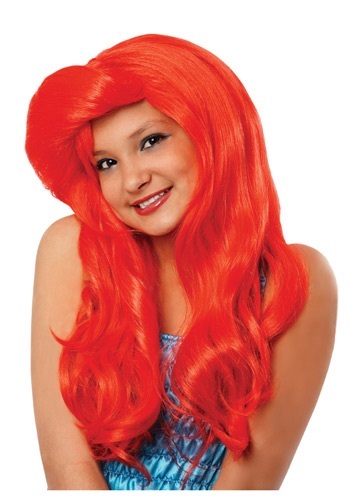 This Kids Mermaid Wig should get her to stop asking you to dye her hair copper-y red. She will wear it on Halloween, of course. But she will also ask to wear it to her middle school dance. And to her writing club at the library, and to school (but just on Monday’s, until it’s Monday’s, and Tuesdays…and on and on.) You get the feeling that at 16 she is going to dye her beautiful brown locks red. She is pretty as a red head, but with this wig you can have a few more years of your beautiful brown haired girl.